There's no question about it, the heart of Milano's vibrant cocktail scene is the Navigli canals area in the southwest part of the town. Unfortunately back in the 90s, this zone also represented the worst drinking area of the city, inspired by a global trend of drinking solely to get wasted. Shots of rum, whisky and coke and Long Island iced tea were the norm in the cocktail bars on Naviglio Grande. To further encourage the consumption of low-quality cocktails, Navigio bars began offering a free buffet of junk food with the purchase of a drink. It wasn’t until 2002, when Edo Nono opened Rita & Cocktails, that a renaissance of “Milano da bere” took place, centered around the Navigli canals area of Milano. Edo won over customers with well-made cocktails with freshly made juices and homemade preparations coupled with quality food. Another key player in the improvement in the Navigli area was Flavio Angiolillo, who first opened MaG café six years ago on Naviglio Grande, a short walk from Rita. Flavio shares a similar mindset as Edo: drink better, not more. Below I list my favorite drinking destinations in SW Milano. When I heard Filippo Sisti was leaving Carlo e Camilla, I was sad. He had propelled the restaurant cocktail bar to the top of everyone's best of Milano lists thanks to his innovative "liquid kitchen" style of drink making. Recently he's opened his game-changing cocktail bar TALEA together with the guys of Pinch, and all of a sudden I'm once again happy. The project is extremely ambitious, with Filippo aiming to give his customers a memorable experience akin to what they'd expect at a Michelin star restaurant. To achieve this difficult feat, TALEA brings together world class hospitality (Petra Dolci, ex Carlo e Camilla handles the floor), a captivating ambiance, and some truly wild yet enjoyable cocktails. His drinks are completely original and he has taken his liquid kitchen concept above and beyond what he was doing at Carlo e Camilla. Amazingly, his team have developed nearly 200 preparations for their initial list - good luck copying his drinks! Filippo's bar team is made up young talents Federico Lombardi and Simone De Angelis whom he intentionally chose because they weren't familiar to most. In this way, customers can more easily become captivated by the overall experience at TALEA: the cool colors of the walls and backbar, the comfortable chairs, and the cocktail eye candy. One of Filippo's goals is to challenge the preconceptions of his guests, serving his drinks seasonally but in reverse: until December using winter ingredients and after December using summer ingredients. A great fresh and sour drink from the list is El Choncho with gin, peach water, pineapple tepache, carot leaf liqueur and chutney of fermented fruit. My favorite drink on the list is the herbaceous and nutty Saving Grace with tonic cordial with aromatic herbs, fenugreek liqueur, blended scotch whisky, lemon and a bouquet of wild herbs. The talent and passion of Filippo Sisti will leave you in awe, as will his wondrous yet accessible drink list that evoke new and gratifying emotions. I can't wait to see TALEA when it's fully operational with the secretive Vivarium "Chef's Table" set to launch in September, serving a 90-minute tasting menu consisting of 5 cocktails paired with food dishes. Yuri Gelmini, a former rubgy player turned plant lover and top bartender recently transformed Surfer's Den into its summer format outside in the beautiful garden. It's worth the 15 minute walk from Naviglio Grande to reach Surfer's Den, a refreshing escape from the chaos of the main Navigli area. Yuri's exciting new summer menu features gorgeous drawings by the talented Bianca Maria Fiorentino. The menu is inside a playful box, with different cards inside for each drink. The idea is to give one box to each table to engage more conversation between people when contemplating which drinks to order. The highlight of the menu, and the best drink I've had in Milano this year, is Les Enfants Verts with Mezcal, Farmily 2017, saffron liqueur, lime, agave, avocado and a chili crusta. The avocado provides a beautiful texture to the drink with a beautiful smokey notes provided by the mezcal complimented by the saltiness and spicyness of the chili crusta. Arguably the most beautiful bar in Milano, the Yard Hotel features peculiar but eye pleasing decorations and furniture. Taking over as Food and Bar manager is the best host in Italy, Mr. Francesco Galdi. With Tucci the current bartender and Fabiana and Anastasia as support, Galdi’s bar team is stacked. Under Galdi’s helm, I can’t wait to see what’s next for the Yard, including the secretive speakeasy and the adjacent Dirty Gym pizzeria. The flagship bar of the MaG family 1930 cocktail bar is an exceptional venue but without a membership card, you can not enter. And so the guys from MaG decided to create BackDoor43, a speakeasy in which you have to book in advance, not because they want to frustrate you, but because its the smallest bar in the world! The brilliant part of this bar is that it also offers a takeaway service, where you can choose from the MaG's most requested drinks. An absolute must visit on any bar tour of Milano! The new menu is odd but brilliant: the customer roles some dice and then must come up with a story based on the symbols rolled, upon which the bartender designs the drink. It inspires a unique and often hilarious conversation, bridging the gap between bartender and customer like no other menu in the world. Iter is Flavio Angiolillo's new project that is tucked away on a quiet street close to the hustle and bustle of Naviglio Grande. Iter is intimate, but spacious, thanks to its high ceilings, where the large bar wooden bar counter is the focal point. Bar stools are replaced with large, comfortable armchairs, at the perfect height to comfortably eat and drink. What makes the first menu at Iter stand out is the use of only Italian ingredients. Obviously there is no shortage of vermouth, amaros and even gins in Italy, but what about spirits like whisky? No problem, they use a great single cask scotch bottled by an Italian at Strathclyde. A great Italian only drink is the Sour cherry gin negroni made with Luxardo sour cherry gin. The real magic of this bar is inspired by its name, which means journey in Latin. Every six months, the boys will go on a trip to a new country, bringing back the best food, liqueurs and spirits to fuse with their Italian menu, making them the first fusion cocktail bar. The latest fusion menu is with Panama, with a strong focus on drinks made with Ron Abuelo Panamá. The greatest strength of Iter is its welcoming and efficient team featuring bar manager Nico Scarnera, head bartender Idris Conti, chef Vincenzo Mignuolo, and floor staff Fede Figliola, Greta Careglio and Lucia Migliacci. Rebelot was born as the spin off tapas bar of Al Pont de Ferr but Luca Vezzali and Erica have recently taken over management, transforming it into a more traditional restaurant with an excellent cocktail program. The cocktail menu has 12 drinks, grouped under Modern Aperitivo, Soda-based, Classics and Gastro. The best I've tried was Cameron's Kick with Irish whiskey, single malt scotch, pear, almond, fino sherry, and black cardamom. Dreaming Pantelleria is a great negroni with a foam of almond milk. For food dishes, I suggest the cold cuts and heavenly pasta alla Norma. The Botanical Club in Via Tortona first opened 5 years ago and is famous for being the first Italian bar to distill its own gin. Called Spleen et Ideal, the artisanal gin features 8 botanicals. My first trip to the Isola location of Botanical was memorable and I was lucky to run into Mattia Capezzuoli managing the bar program at Botanical Tortona. In addition to excellent cocktails with beautiful ice thanks to an in-house Hoshizaki, you can try some outstanding raw fish at Botanical. Not to be missed is the best poke salad in the city. When you visit the Mag in Ripa di Porta Ticinese 43 there is the feeling of entering a Parisian café in Montmartre. The bar is decorated with great taste with hundreds of items purchased at antique markets. The bar is dimly lit, giving Mag an intimate and relaxing atmosphere. In addition to the head Flavio Angiolillo, the bar team features the talented Francesco Bonazzi and Marianna Di Leo. Thanks to these names and an enchanting atmosphere, MaG always remains a reference point for drinking in the city. The latest drink theme involves astrological signs, continuing their tradition of creative menus. Mattia Lissoni, decided to open up a bar with a similar formula as MAG: great drinks and cool people. As soon as you enter, the cozy atmosphere will immediately remind you of MAG, but with a British flair. If you must do the Milanese happy hour, Pinch is easily your best bet on the Navigli as they serve refreshingly original sides to go along with your drink. From the latest drink list, don't miss the flavorful Terra cocktail with scotch whisky, Japanese prune liqueur, Marsala, orange and Angostura bitters. Mercurio, a revisited whisky-based Bloody Mary is also a delight for the palate. Taking over Pinch as bar manager is the impossible not to love Erik Viola, who happens to also be one of the best bartenders in Milano. Before Luca and Andrea, before MaG, there was Rita, born in 2002 in Via Fumagalli 1. The secret of its success? Refreshing cocktails, natural ingredients, always top quality products. The perfect spot to sit is at the counter, so you can admire the splendor of the majestic bottles and the other customers sitting around the sociable U-shaped bar counter. There is a feeling of serenity in Rita, despite the chaos of the Milanese aperitif. The signature drink is the Gin Zen with ginger, gin, lime, cordial lime, soda, crushed ice and is fresh, sour and refreshing and a great start for the summer evening. If you have the good fortune of meeting the owner Edo Nono, you will understand what Pier Strazzeri means when he says "When I grow up, I want to be like Edo". 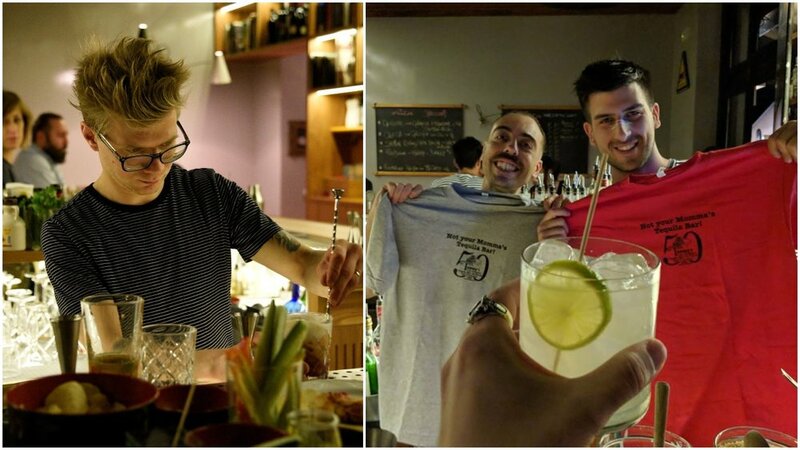 Leo Todisco (ex Lacerba) is the head bartender and is joined by Simone and Niccolò, who always deliver you a great drink with a smile. Don't forget the food at Rita, which is delicious thanks to chef and co-owner Luca Chiaruttini, the other owner of the bar. I suggest the delicious Coca-Cola chicken wings. Sakeya in via Cesare da Sesto 1 is Japanese inspired restaurant and bar, featuring a beautiful interior design with dark wooden touches, small couches and comfortable arm chairs in the first room, which is devoted to cocktails and sake tasting. The main dining area is located in the back, having more conventional tables and the giant collection of sake bottles (approximately 200) lining the walls. Many of the cocktails are made with sake, the alcoholic Japanese beverage made from fermented rice. Bar manager Alessio Simonini explained that anyone who wants to at Sakeya must take a sake sommelier course. If you want to try the sake as opposed to a cocktail, speak to the talented head sommelier Kinya Shimizu, who will help you choose the right sake for you, and also suggest great food pairings. However as a cocktail lover, I focused on the cocktails at Sakeya, with my favorites being the Wagyu Old Fashioned (bourbon aromatized with Wagyu beef and white truffle, Angostura bitters, 7 spices Kuro Shichimi) and the Soju Negroni. Half-restaurant, half-cocktail bar, Carlo and Camilla in Segheria is located in a building that was previously a sawmill. They decided to leave the space structurally the same with damaged walls, a wooden roof and exposed beams. Instead of sitting down in the main dining room, try their cocktail bar located at the far right. The bar team proudly carries the torch passed by Filippo Sisti, also inspired to the use the best techniques and ingredients from the kitchen in his cocktail making. The industrial chic atmosphere is an ideal setting to enjoy one of the drinks whether at the bar, or one of the small tables. If you get hungry, you won't be disappointed by chef Cracco's cooking. Get the bucantino alla gricia di tonno!